Getting into the final stretch, I was starting to feel the strain of this trip a little. With cooking, like any creative endeavor, you have your good days and your off days and this dinner, although it was still perfectly tasty, wasn’t up to my usual standards. Last Wednesday, I cooked for Rich, his wife and 2 of their friends. Rich is the founder of the lean startup circle in San Francisco and also the co-founder of Stylous, a women’s fashion startup. I always admire people who choose to build products for people who are not themselves because it’s a difficult thing to do. Non-technical people have been traditionally under served by the transformational shift in technology and anybody working to seriously address that imbalance is doing good work in my book. Rich is also the proud father of a 3 week old little girl so I was really happy to give both him and his wife a good meal and have them not think about getting food on the table for at least one evening. Immediately, when I walked into the market, I saw these gorgeous beef shanks in prominent display and my mind immediately leaped to osso bucco. 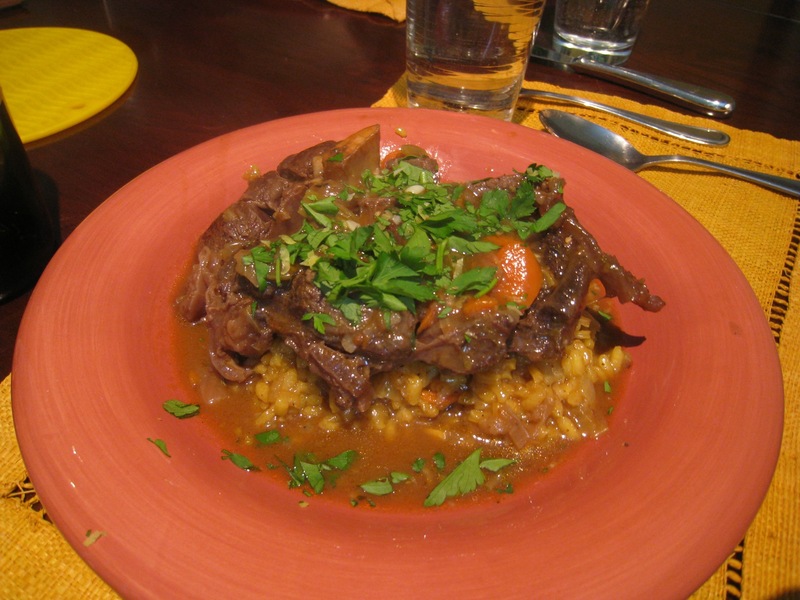 Osso bucco is a classic Italian dish, traditionally made with veal shanks but now more commonly made with beef. Apart from that, it’s a pretty classic braise, I make mine with onions, celery, carrot, garlic, tomato paste, red wine, beef stock, bayleaves & thyme. The classic accompaniment to an osso bucco is risotto milanese which is risotto flavored with saffron and marrow from the shank bones. Now that I had the main down, I really wanted to do a soup since I’d been doing mainly salads at this point. Rich had just had this week a minestrone soup and a tomato soup which were my first two thoughts so, in the end, I settled on a French Onion soup. 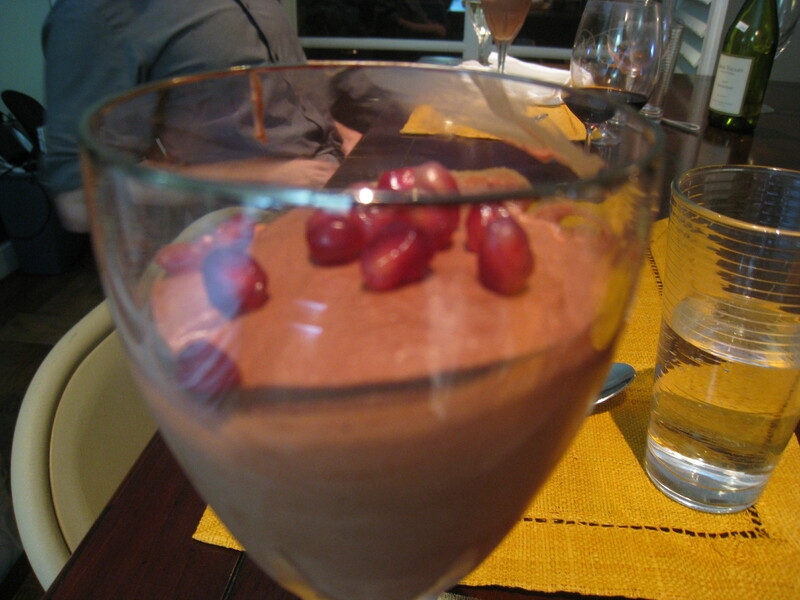 Finally, for dessert, I wanted to do something with chocolate and chocolate mousse was an old standby that I could do in my sleep so that was the dessert. Paradoxically, this should have been one of my best dinners but it ended up turning into one of my worst. Rich loves to cook and had a well equipped kitchen, we were shopping for quality, organic ingredients and we had plenty of time. And that, I think was the problem. It’s been a long two weeks and I’ve been fighting the onset of a cold over the last few days due to lack of sleep. I was feeling pretty puffed up from all the accolades I’d been receiving, both online and in person and I decided that I could coast a little and nobody would know the difference. Unfortunately, it’s somehow always the easiest tasks which people end up having the most problems with. Because I wasn’t stretching myself or keeping my eye on the game, there were points at which I flubbed some basic things. Oversalting was a big problem I had with this dinner to a degree I don’t often have, flavors were just a tad off balance and there wasn’t that oomph I was used to delivering. However, these were still minor nits, overall, the food was still at the level of acceptable, just not great. For some readers, it may be obvious why I’m calling the above menu an example of coasting but, for the majority of people, they would look at that and think that was a perfectly delicious menu that they would be happy to eat. It’s difficult to write for people with different experiences and knowledge about food. I’ve generally written these reports aimed at the highest level of understanding on the general principle that when I’m reading a discussion of a field that’s entirely alien to me, I prefer to read the undumbed down version. Even if I don’t understand absolutely everything, I still enjoy the general cadence and voice of someone talking in the insider’s language. This section is an attempt to reach out and educate people less knowledgeable about food so feel free to skip this if it sounds like something you already know. There is a distinction, at least within Western Cuisine, between classic and modern cooking. In classical cooking (pretty much all cooking before the 1960’s) there is a corpus of classical recipes from which you drew on and everyone drew from that same classical corpus. The mark of skill for a chef was in the faithful rendition of the platonic ideal of a dish. You see the same forces play out in, say, American-Chinese restaurants today. Walk into any American-Chinese restaurant in the country today, from food court style all the way up to fancy, white tablecloth and you will find roughly the same set of dishes on the menu: Kung Pao Chicken, General Tso’s Chicken, Sweet & Sour Pork, Moo Shu Pork, Beef & Broccoli etc. Different American-Chinese restaurants may put their own interpretation on the general framework of the dishes and produce items of varying quality and skill but the craft of the cooking is in making a faithful rendition of some platonic ideal. Modern cooking, from the beginning of Nouvelle Cuisine in the 60’s, became about throwing away the restrictive shackles of the classic french canon and thinking of food again as an inventive process rather than a replicative one. Nouvelle Cuisine is now derided as “tall food and small portions” but some of the changes were genuinely revolutionary but have so pervaded out food consciousness these days that we’ve forgotten their origins. From Nouvelle Cuisine came the philosophy that the classic recipes were not unique, singular, harmonious expressions of ingredients but that the space of delicious things left to be discovered was far vaster than the few examples that were part of the classic canon. Modern cuisine prides originality as well as execution. It’s all about finding new flavor expressions or new ways of expressing classic flavor combination (deconstruction). As a philosophy, I have more affinity to modern cuisine than classical cuisine and, when I cook, the exploration of flavors and discovering of new dishes is a huge part of the appeal. The way to recognize classical cuisine is that the dishes are named after people or places: Spaghetti Bolognese, Chicken a la King, Lobster Thermidor. The way to recognize modern cuisine is that the dish descriptions either are just a bag of ingredients or containn quotation marks. Short Ribs, Celeriac Puree, Summer Vegetables, A “timbale” of lobster with a “cappuchino” of mushroom, Duck, Leek & Mushroom “Lasagna”. At it’s worst excesses, modern cuisine can resemble the ingredient mad libs that so often parodies it. Quails Brains on a Cucumber “Au Gratin” with Dark Chocolate “Foam” would taste exactly as horrific as it sounds. But what I’ve tried to show with some of my previous blog posts is how good modern cuisine is based on a solid foundation of learned experience and principles and the reasoning behind the process I use to innovate. So, when I say that a menu is “tired” or “uninspired”, what I mean is that there’s very little thought put into the makeup of the dish and all I’m doing is providing a competent and faithful representation of a generic original. I was, in essence, making someone else’s food rather than making my food. 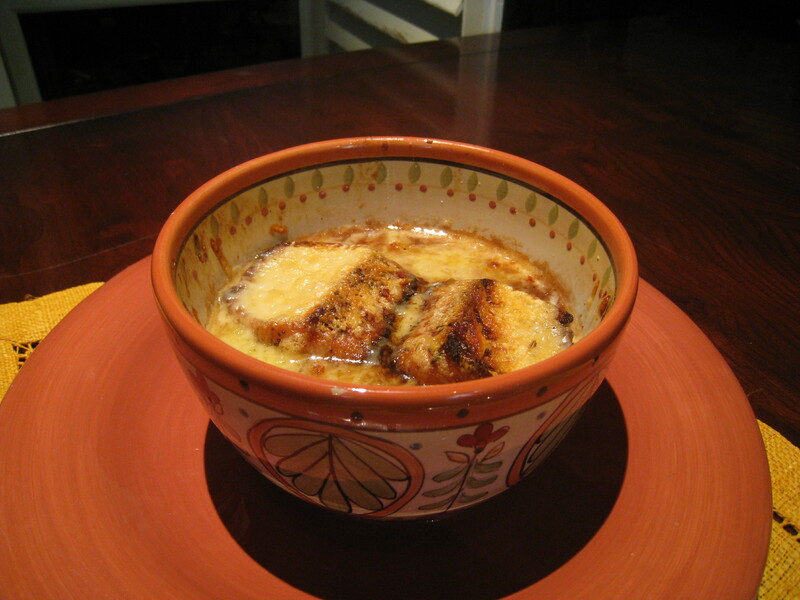 French Onion Soup is all about the slow, careful caramelization of onions and I simply didn’t get the timing right on this one. A combination of not getting a start on this right away and using a pot that was too tall and narrow meant that it took an hour after I planned before the onions were caramelized to the point I would like. With enough gruyere & croutons on top, it’s hard to make a truly bad French Onion Soup but this was not one of my best. Osso Bucco is all about exploring the wonders that is the shank. The shank contains some of the most flavorful yet hardest to cook meat on an animal. Braised with onions, celery, carrot, garlic, red wine, beef stock & herbs, it becomes a rich and tender chunk of beef. Risotto Milanese is the classic accompaniment as the bone marrow from the beef shanks can be used to enhance the risotto. This was rich and lovely, if a tad oversalted. The chocolate mousse was rich and had just the right texture and sweetness. The pomegranates were a nice textural addition but the blood orange did nothing for the dish. Overall, it was a nice finish to the meal and I was glad it ended on a high note.